All of us at New Museum Los Gatos are so grateful for your support of NUMU. Our FY17 Annual Report will reveal many exciting successes we experienced last year. 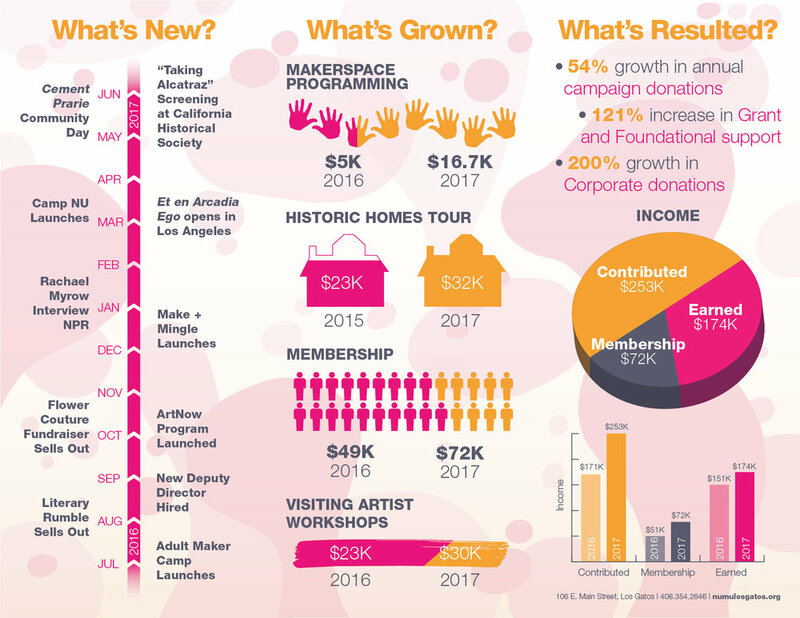 Once again, we have had a year of incredible growth, financially and program-wide. Highlights include our Cement Prairie exhibition featured as a program at the California Historical Society in San Francisco while another exhibit, Arcadia et Ego traveled to Los Angeles. MakerSpace Open Studio attendance soared and submissions to our Annual High School exhibition, ArtNow reached an all time high! Each year our Annual Campaign creates funding for expenses that are integral to NUMU’s operation. These donations provide the foundation on which NUMU continues to build and grow. Our FY17 Annual Campaign last push in June exceeded expectations and raised over $33,000 helping us to end the year at our budget goals. Our total FY2017 Annual Campaign raised over $84,000 and income in other major contributed categories such as Grants and Corporate donations also exceeded goals. Fifty years ago, revolution was in the air. In the Bay Area, the civil rights movement shaped a new vision of the world. As we learn from our current exhibits, people come together to make change. Change is a process of which support is an important ingredient. Your support this past year has been so important as it allows us to continually change, adapt and to present a new way of seeing. This coming year we have many new and eye opening experiences to share with you. While some may say we wear rose-colored glasses, our vision has never been clearer. Our sights are set to illuminate the artists, histories and innovators of our time. Thank you for sharing our vision!